There was a time, centuries and centuries ago, when the only way to travel was by foot. We then discovered that we could use some of our trusty animals to take us places – horses, donkeys, and camels could get us from A to B. Now there are so many different forms of transport that there’s pretty much nowhere in the world you can’t get to. What is probably the most used (I believe) is the car. It’s one of the easiest forms of transport to use and if you’re lucky enough to own one and drive, you don’t need to rely on anybody to get you to where you want to be. Many people have great stories of road tripping across America, Australia, Europe, with a passport and a full tank of petrol you’re ready to go. I remember my father telling me that back in his 20s, when it wasn’t so popular to fly, he would hitchhike through Europe, something that was completely safe back then. And all thanks to the wonderful car! Another mode of transport commonly used across the world is the train. From the Eurostar to the bullet trains of Japan to the crazy passenger filled trains of India, the train is a reliable source of travel if you want to just sit back and watch the scenery. And it’s not only the big trains that take you across countries that are a great form of transport, you also have the different train systems found in cities like Paris, Seoul, New York and London, these are intricate networks that connect you to places within the same city. One of the most exciting forms of transport has to be the plane. What other mode of transport can get you flying high in the sky like a bird (OK there are a couple of others, but for mass people travel this is number 1!). There’s nothing like the feeling of taking off in one country and landing in another. It’s also the quickest way to travel from country to country – not sure I fancy driving from London to Sydney!! And finally (because I could really get into detail about all forms of transport) is the boat. From the humble ferry boat to the cruise ship, boats are all so different. 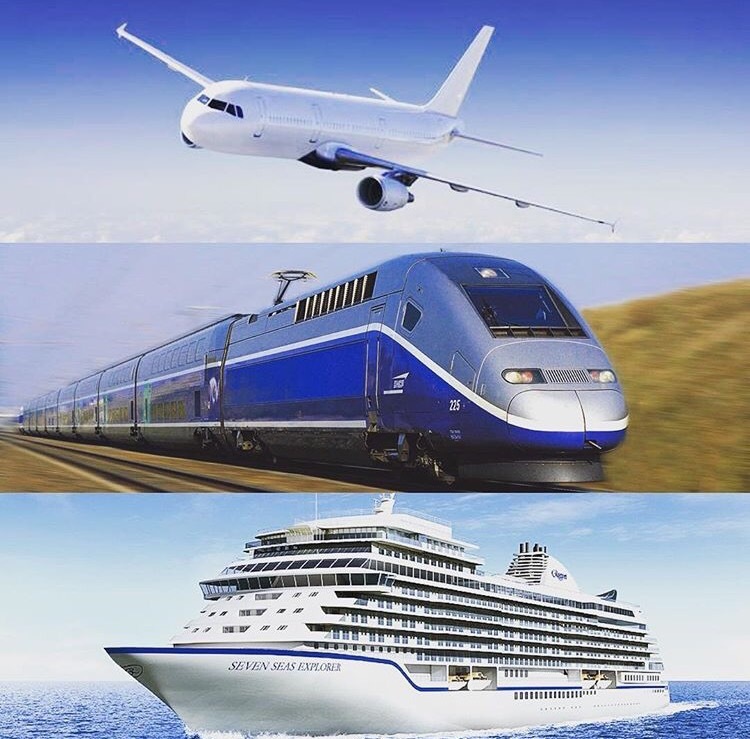 Though not always the fastest way to get around, if you are on a cruise which has a casino, cinema, swimming pool, golf course and who knows what else, I’m sure you don’t mind taking your time sailing the ocean shores to visit different cities. It’s all part of the experience!